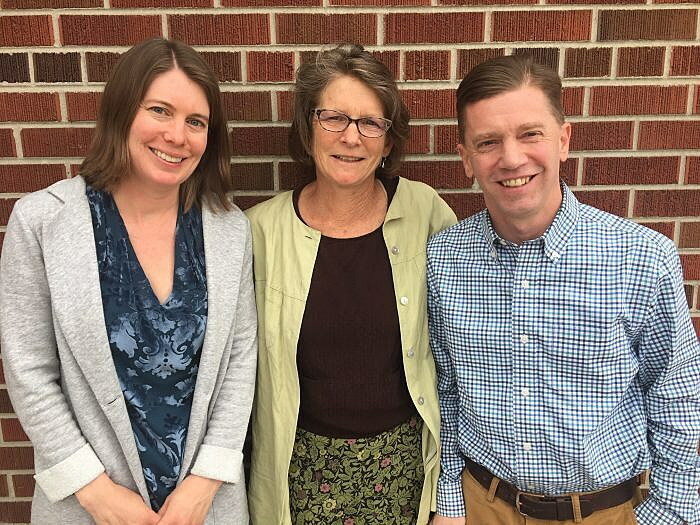 Diana Maneta, Amy Cilimburg and Chase Jones, three authors of the 100% Clean Electricity Options Report, worked with community partners and elected officials to craft and then pass Missoula’s 100% Resolution. What a week it’s been in Missoula: two momentous decisions where the emergency of climate change took center stage. Two local government actions, years in the making, that community advocacy helped drive forward. Missoula is now on the map as a national climate leader, first with our commitment to 100% clean electricity and then, where the rubber meets the road, a decision by county commissioners to require new enterprises that use exorbitant amounts of electricity to be powered by new renewable energy sources. I am so very proud of our community. On Wednesday, Missoula’s City Council and Board of County Commissioners together voted unanimously to support a resolution to transition Missoula to 100% clean electricity by 2030. At this joint meeting, my colleagues Chase Jones, the City’s energy conservation and climate action coordinator, and Diana Maneta, Missoula County’s energy conservation and sustainability coordinator, and I explained the nuts and bolts of this resolution and the Options Report that is its foundation. ‘We live in a strange world. But it’s the world that my generation has been handed. It’s the only world we’ve got. We are now standing at a crossroads in history. We are failing but we have not yet failed. Skye Borden, Environment Montana: “Today, we can harness clean, abundant energy more efficiently and cheaply than ever before. Yet we’re still producing, consuming and wasting energy in ways that are doing lasting damage to our environment, our health and our climate. Given the headwinds we’re facing in D.C., we’re really counting on local leaders — just like yourselves — to step up and take the initiative on a transition to clean, renewable energy. These are just a few of the hopeful public voices. They’re bolstered by over 500 individuals, businesses and organizations that wrote letters of support or signed this letter asking our elected officials to act on climate, including the Missoula Federal Credit Union, Providence St. Patrick Hospital, WGM Group, MMW Architects, Montana Wildlife Federation, Montana Conservation Voters, Garden City Harvest, American Lung Association, and many, many more. And it’s not too late, you can join in and sign today! Sure enough, this hope turned to action the very next day when the Board of County Commissioners voted unanimously to adopt interim zoning regulations for cryptocurrency mining operations. For the last couple years, Missoula County grappled with how to square commitments to acting on the emergency of climate change with new energy-intensive industry, specifically cryptocurrency mining. Although just how this enterprise works is a bit complicated (see the county’s website for clear explanations), suffice to say that the electricity use is mind-boggling – one Bonner business is estimated to use the same amount of energy as one-third of all the residents of Missoula County. The commissioners understand that if cryptocurrency mining expands in our county, we cannot meet our climate commitments. They recognize that once goals are established and commitments are made, actions must follow. The interim zoning regulation offers a unique solution: If you expand or start a new cryptocurrency mining operation, you need to power it with new renewable electricity. The regulation requires these entities to develop or buy into new renewable energy sources, rather than drawing from existing renewable energy sources. This is critical, because when a new large energy user comes in and makes use of our existing renewable energy resources, the effect is that other electrical customers who were previously using that renewable resource are shifted onto other sources of electricity, likely fossil fuels. The only way to avoid a big increase in greenhouse gas emissions is for the new large energy user to bring new renewable energy with it. That’s exactly what the county regulation requires. Climate Smart Missoula is proud that our community is up to the task of solving the climate emergency. By working together with local government, businesses, organizations and individuals to act on this climate urgency, we create ripples of hope. What a week! April 9. Climate Change & Extreme Events — how will cities respond? Free public lecture by Professor Nancy Grimm of Arizona State University. UM’s Todd building, room 204, 4pm. April 9. Climate Change Science and Policy panel. Featuring panelists speaking about climate science, climate justice, local and federal policy. Missoula Food Bank, 7pm. April 11. Climate Smart Missoula’s Monthly Meetup: Local Food & Agriculture. Imagine Nation Brewing Co., 5 – 6:30pm. April 20. Clark Fork Coalition’s Annual River Clean Up . Starts at Caras Park at 9:30am.